While digitizing the logs of The Graves Lighthouse in Boston Harbor, I noticed several entries about packages being dropped from an airplane. The keepers at this offshore station considered this a noteworthy event and probably appreciated some Christmas cheer while separated from their families during the holiday. (The Graves was what was called a “stag station” — there was no accommodation for families.) In future years the log identifies the pilot as Capt. Wincapaw, who started the Flying Santa tradition. In the early days of aviation, pilots, like mariners, often used lighthouses to track their location. Lacking sophisticated navigational equipment, they sometimes relied on lighthouses to set their course in stormy or inclement weather. One such pilot, Captain William H. Wincapaw, a native of Friendship, Maine, flew a variety of aircraft, including amphibious planes around the Penobscot Bay area. In 1929, Captain Wincapaw, flying blind in a snowstorm and low on fuel, spotted the gleam of Dice Head Light, which led him safely home. To show his appreciation he dropped gifts to light stations in the Rockland area and began the tradition of the Flying Santa. In 1935, Capt. Wincapaw has to make two attempts to delivery the packages to The Graves. The packages containing newspapers, magazines, coffee, candy, and other items were so well received and the keepers and their families so appreciative that Wincapaw expanded the tradition to include light stations not only in Maine, but all over New England. In 1938 Edward Rowe Snow took over job and continued delivering packages until 1980. Today the Friends of Flying Santa continue this tradition of showing gratitude to modern-day Coast Guard personnel and their families. Note the entry regarding Edward R. Snow’s participation in the anniversary of nearby Minots Ledge Lighthouse. He later took over the Flying Santa tradition when Wincapaw was transferred out of the area. Note that some of this text is excerpted from my book Maine Lighthouses: Documentation of Their Past. 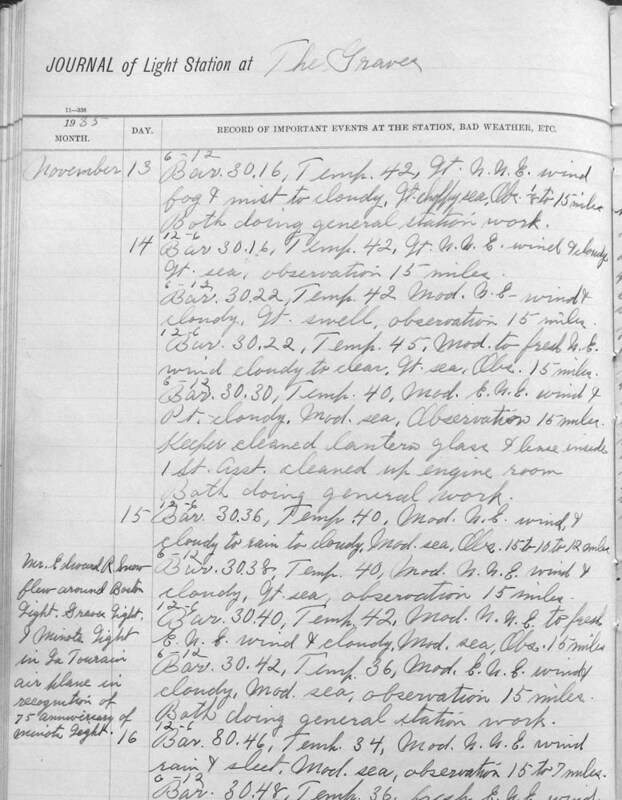 This entry was posted in Historic documents and tagged aviation, Edward R. Snow, Flying Santa, lighthouse logs, The Graves lighthouse, William H. Wincapaw on December 27, 2013 by lighthousehistory. 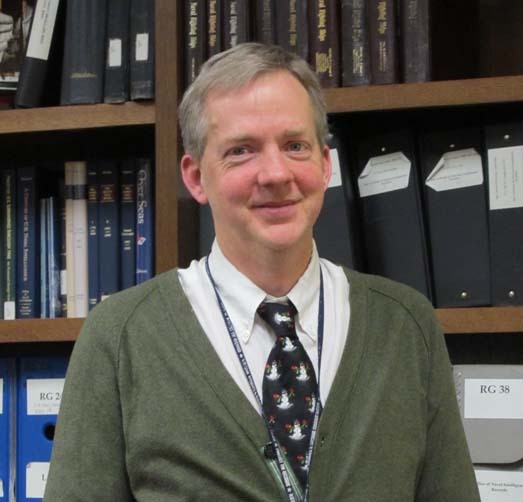 Archivist Mark Mollan assists researchers doing maritime and navy research at the National Archives in downtown Washington, D.C. He’s made working with Record Group 26 a whole lot easier in recent years by creating box lists for some of the more extensive entries. You can access these lists, many in the volumes pictured below, in the finding aids room on the first floor of the National Archives. (The same place you fill out pull slips to retrieve the records.) He or someone else is always on duty to assist you with your search. Some of the finding aids for Record Group 26. 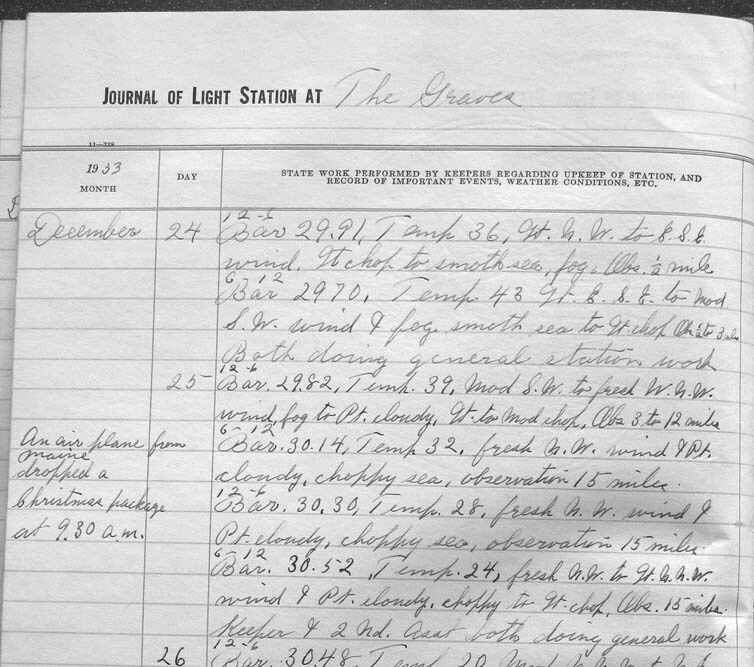 RG 26 includes records of the Lighthouse Service, Lifesaving Service, Revenue Cutter Service, and the U.S. Coast Guard. Mark has kindly shared many of these box lists with me in a digital format and I have included them in my finding aid for Record Group 26. 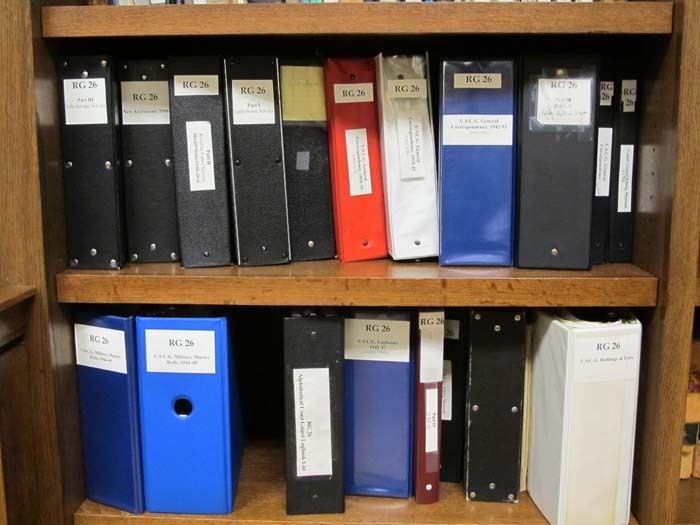 One of the most helpful is the box list for the USCG general correspondence in RG 26 Entry 82. This correspondence is organized into three time periods and a fourth segment devoted to site files for stations (primarily lifesaving/lifeboat stations). The files are organized according to USCG file manual, for example, 600 designates “Operations”, 601 “Scope of Operations”, etc. So before Mark’s list, one had to pull everything under a file number and hope you found what you needed. Now with the box list you can search for a specific topic, station, or vessel within the list. Here is one segment as a WORD document. Notice it is in two parts because it is a long list! Mark has also identified all the WWII logbooks when the U.S. Coast Guard under the administration of the U.S. Navy. Those for 1942 and 1943 are available in my finding aid. My sincere thanks to Mark for creating these useful research tools. He has made my job a lot easier! 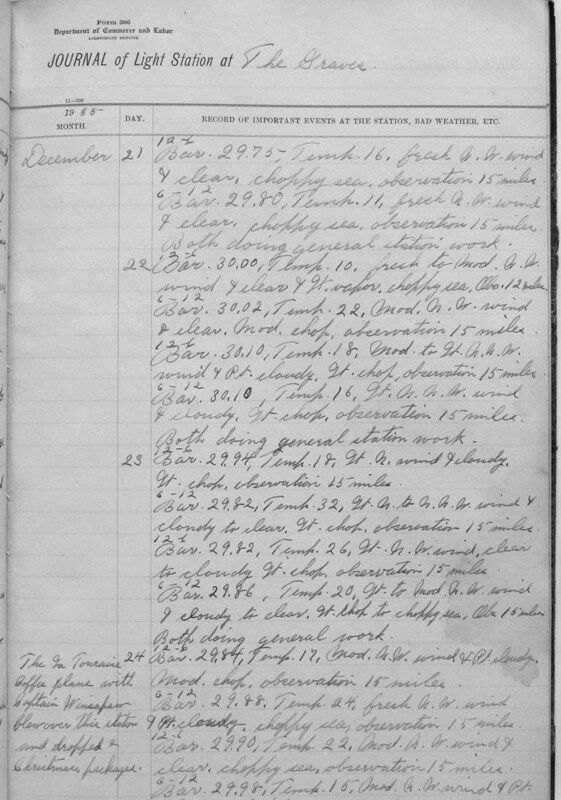 This entry was posted in Historic documents, Research and tagged finding aids, lighthouse research, National Archives, U.S. Coast Guard on December 18, 2013 by lighthousehistory. A keeper was expected to understand how to operate the apparatus and use strict economy in the use of his supplies: “He must be careful to prevent waste, theft, or misapplication of light-house property.” Quantities of oil and other supplies used each day had to be recorded. Shipwrecks were to be reported promptly to the inspector. “It is the duty of light-keepers to aid wrecked persons as far as lies in their power.” Precautions had to be taken against fire; fire-buckets were to be kept filled and ready. Burning mineral oil, or kerosene, was to be extinguished with sand or ashes rather than water. 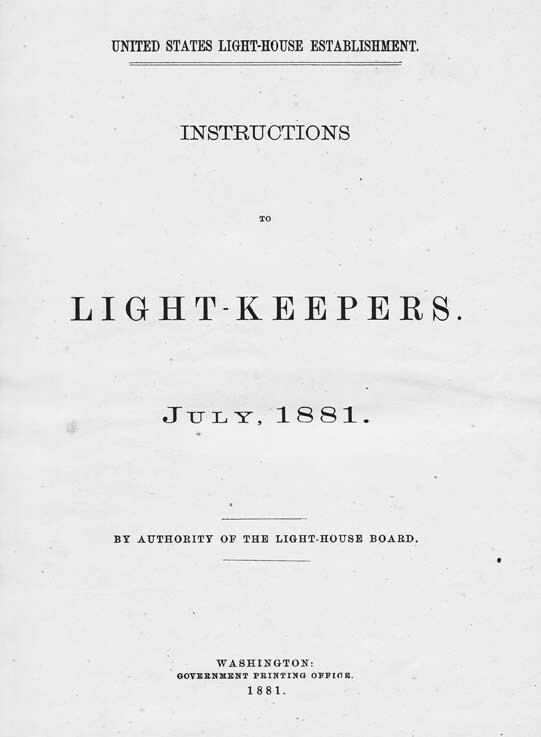 A section devoted to the “Care of Lights and their Appurtenances” included detailed instructions on the care of the optics. The keepers were to hang lantern curtains each morning and to wear a linen apron to protect the lens “from contact with the wearing apparel.” The lens and lantern glass were to be cleaned daily. Rouge was used to polish the lens and “rotten-stone” to shine the brass. “Keepers are forbidden to use any other materials for cleaning and polishing than those supplied by the Light-house Establishment.” The revolving clockwork and carriage rollers were to be kept properly oiled. Keepers had to cut replacement glass for the lantern when necessary. This summary was excerpted from Nineteenth-Century Lights: Historic Images of American Lighthouses by Candace and Mary Louise Clifford (Alexandria, VA: Cypress Communications, 2000). To view a PDF of the original document goto my digitized volumes page. 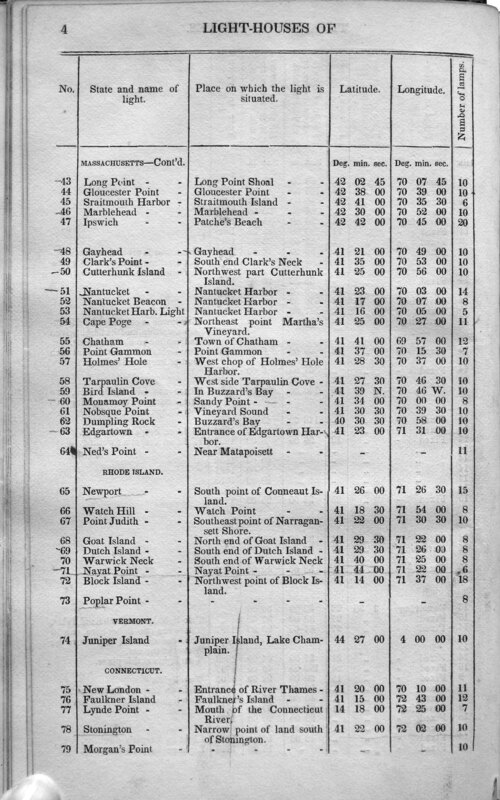 This entry was posted in Historic documents, Lighthouse keepers, Research on December 12, 2013 by lighthousehistory. 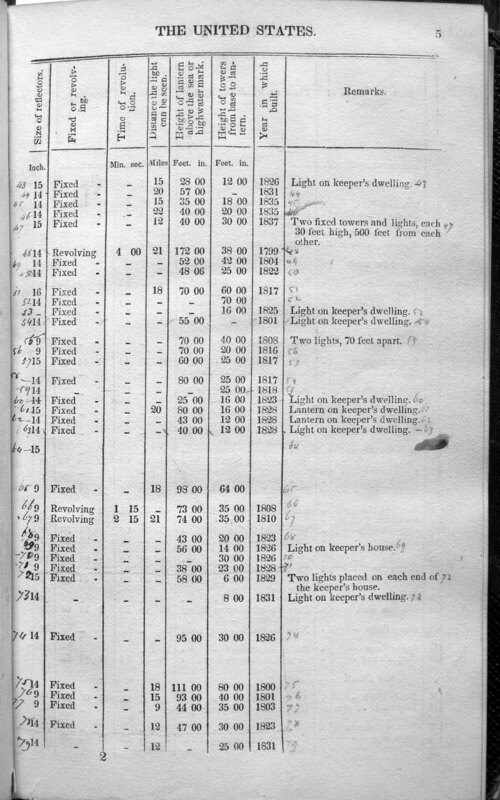 Light Lists are a useful research tool for tracking lighthouses over time. Here are a few pages from a very early version entitled, Light-houses, Beacons, and Floating Lights, of the United States, for 1838 prepared by the order of Stephen Pleasonton, Fifth Auditor and Acting Commissioner of the Revenue. The pages are meant to be side by side. Note the stray markings on this copy. They were corrections meant for the next version. For the complete list in PDF format goto my new research page for digitized volumes. This entry was posted in Historic documents, Research and tagged aids to navigation, Light Lists on December 10, 2013 by lighthousehistory. 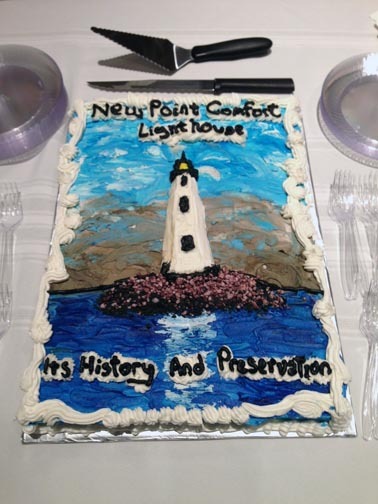 As a followup to my post “New Book about New Point Comfort Lighthouse,” I wanted to share this photo of the cake served at the book launch. Isn’t a work of art? I hated to cut into it! The cake was based on the cover of the book which you can see in the earlier post. Mathews County Historical Society hosted a reception to launch the book as well as several book signings at their visitor’s center. The support from the community was tremendous! We enjoyed meeting keeper’s descendants, folks involved in preserving the lighthouse, folks who lived near the lighthouse, and those who simply loved the lighthouse. We’re delighted profits from the book will go toward preserving this wonderful landmark! The book will be sold locally at the Mathews County Visitor Center, 239 Main Street, Mathews or you may order by mailing a check (made out to MCHS) to MCHS, P.O. Box 855, Mathews, VA 23109. Hard cover books are $28.00 plus $5.00 VA sales tax and shipping and soft cover books $20.00 and $4.50 VA sales tax and shipping. We signed some extra hardcovers so for a limited time you may be able to request an autographed hardcover. This entry was posted in Books and tagged Mathews County Historical Society, New Point Comfort Lighthouse on December 6, 2013 by lighthousehistory.